Rick passed away on Oct 4, 2018. Thank you for your prayers and support during this difficult time. We have been blessed by everyone's heartfelt concern this past year. We have had a relaxing winter and feel like we are ready to start this new season of our lives. The kids have made it very clear that they all love our farm and the life we have made for ourselves. We want to continue farming and supplying you with the same great produce you have come to love. Thank you for your patience while we learn how to do all the things that Rick made look easy. It will be a challenging year of finding our "new normal", but we are confident that with the continued support of our faith, family and community we will be able to carry on. Why is organic corn so expensive? For the most part all the feedback we receive on our produce is very positive and encouraging. And although customers always comment on how our corn is the "best they've ever tasted", some also ask why it is so expensive. This is a reasonable question, as our corn is $10/doz or $1 a cob. There are a number of reasons our corn costs a lot of money and if you care enough to read on, I am happy to explain. First of all, like all of our produce, it is grown organically which generally means greater risks and more labour. I should note that it is not certified organic (which would cost even more and cause a bunch of paper work). The seed is untreated, which makes early germination in the field nearly impossible. 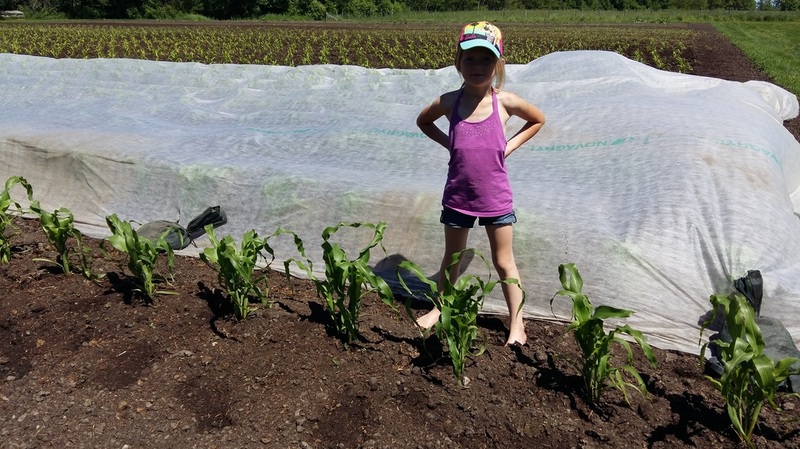 So we start the corn in the greenhouse and then transplant it out into the fields. This yields earlier corn, but increases the cost and labour of production. Once transplanted in the field most of it is covered with row cover for further frost protection (yep, more cost and labour). The next step is weeding. This is all done with a hoe. As you might guess, this takes a considerable amount of time and energy. What about pest control? Well, we have an organically certified product (BTK) that we spray on the corn to reduce the amount of corn borers (aka worms). This slows them down, but doesn't do a good enough job. So we have also found it necessary to buy beneficial bugs (parasitic wasps) out of Ontario and have them shipped out. This helps to keep the worm population under control, but increases the cost of production. Then we are ready for harvest. Rick has very high quality standards (which is why we get all the comments on it being "the best corn"). He hand picks the corn, fresh, several times a day, and inspects every cob himself. There is a lot of corn that does not meet his criteria, it will either be past its prime, have worm damage or some other flaw. Don't worry, it is not totally wasted as the pigs, cows and chickens love to feast on it. Even with our high price, corn is one of our least profitable crops. It requires a large amount of field space, labour, input costs and care. It is also the crop that produces the least amount per square foot and yet takes the most nutrients out of the soil. So why do we bother growing it? 1.) We love eatting our corn! 2.) Our customers love eatting our corn! 3.) Rick likes the challenge of trying to have the earliest corn in Manitoba (his own personal competition that other growers have no knowledge of). And just for the record...to the best of our knowledge, he has won for the past several years! We are always trying to improve our production methods and grow the most tasty, nutritious and affordable produce possible. We keep extensive notes on all our crops to know what it costs to produce and therefore how much we need to charge. As the saying goes, "You get what you pay for". We hope that when you buy corn from us, you get to experience corn at its best. A very tasty treat! 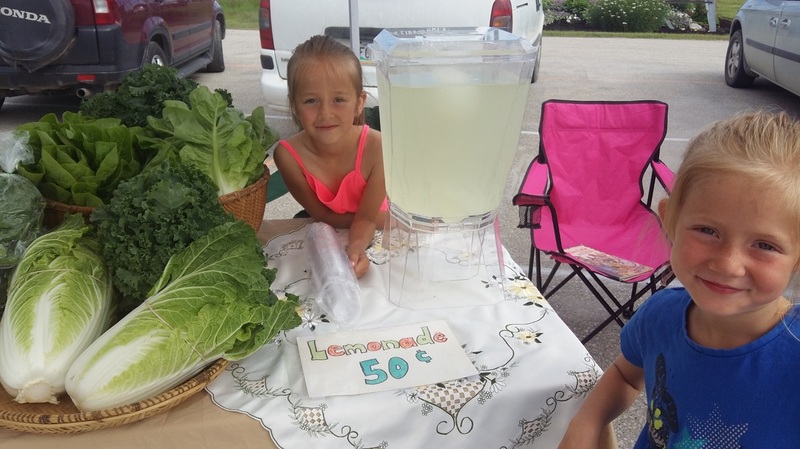 Eat Healthy, Eat Fresh, Eat Local! School is out and summer holidays have begun! While you're making your plans for the summer, make sure to think about what you'll be eating. Every fall as the snow starts to fall, I have customers tell me they want to start making smoothies and green drinks. They have decided to start eating local and healthier....but they best time to do that is right now. The vegetable season (and berries from a lot of other local Manitoba farms) is just getting started and it tastes so good! This summer, check out your local farmers' market! Hope you all enjoy a wonderful, healthy summer! Happy Canada Day! The gardens are looking great and we're looking forward to an awesome season! 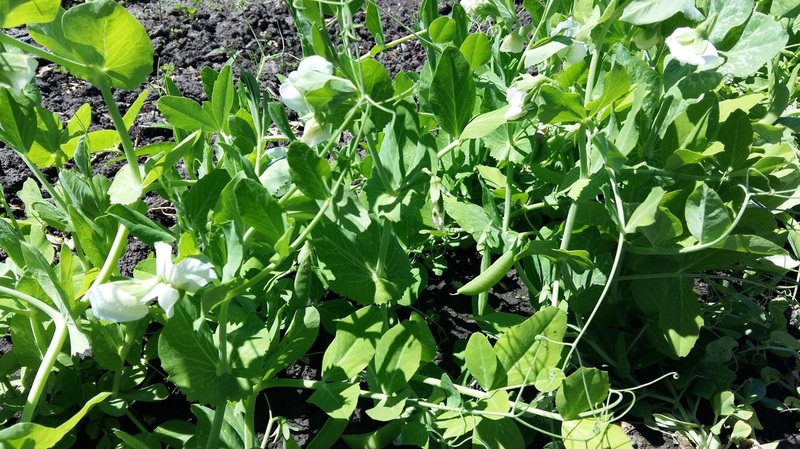 We've eaten a few peas already and should have some for sale in about a week. 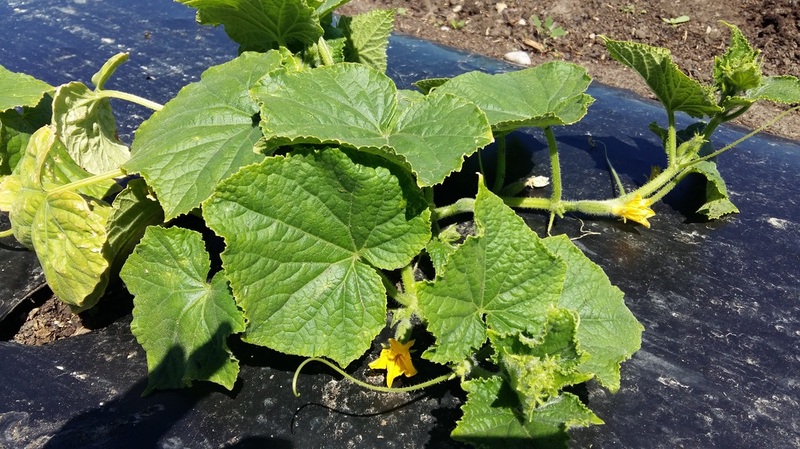 The cucumbers have set fruit and should be ready in a couple weeks. We are taking orders for pickling cukes. The corn is looking good too, but it is still going to be a while before we're eating fresh corn on the cob! The greenhouse still has a fair amount of flowers, vegetable and herb plants. So if you need to fill in any gaps in your garden or flower bed, stop by before it's too late. We also still have a few pumpkin plants left for our annual pumpkin growing contest. Please ask for one, sometimes I forget to hand them out! It's a great way for me to increase our odds of winning!!! The greenhouse is open this weekend and the plants are looking great! If you are looking for healthy transplants for a successful garden, this is the place to shop. We have a good selection of annual flowers and lots of vegetable and herb plants to choose from. The first blooms in the greenhouse are always so beautiful! 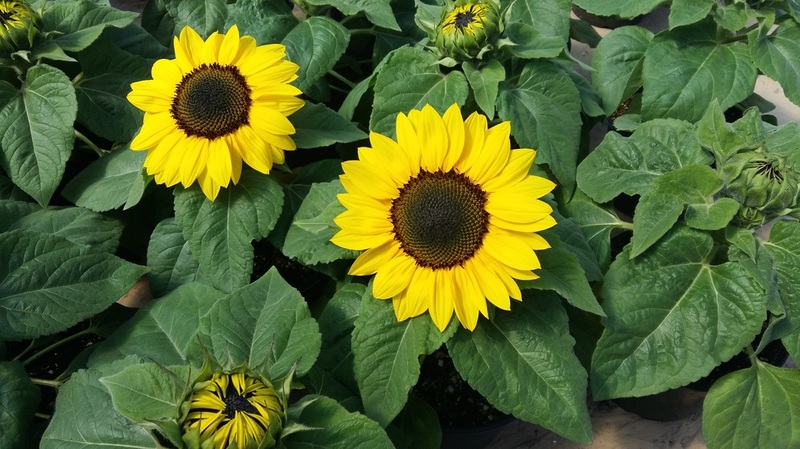 These gorgeous sunflowers will be given to Mothers who stop by the greenhouse. It's time to start planning for springtime! We've started pouring through seed catalogs and making field plans as well as thinking of new ideas for our farm. We are looking into starting farm tours this spring. There are a number of people who have already had a chance to wander around our farm and see first hand how our farm operates. Of course its never just that simple. So now we get to do the paperwork and since our insurance providers won't cover it, we'll have to start searching for someone who will. Fun times! I've also started to prepare for the summer rush by stocking the shelves. I freeze berries in summer (when there's no time to work with them) and I make jam in the winter months. I finally got to making Raspberry Jam, which was the customer favorite this year. I also made my favorite, Strawberry Rhubarb Jam! It's amazing how much you can do when the kids go to Grandmas for a sleepover! 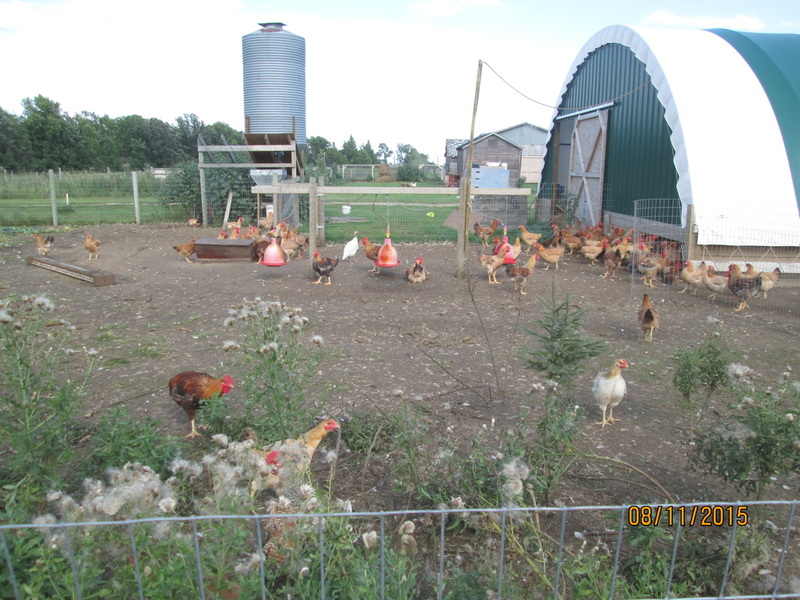 Delivering Farm Fresh Eggs to Winnipeg ? 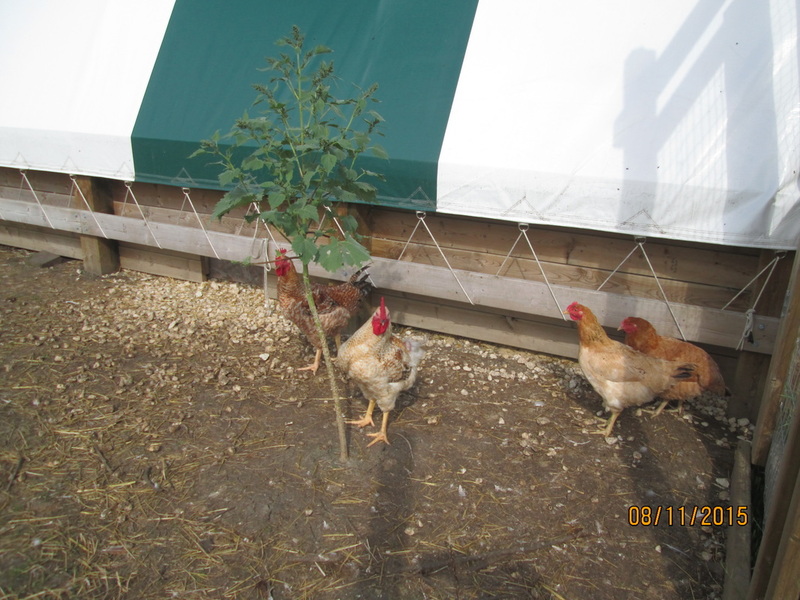 During the winter months we have a large supply of fresh farm eggs. We are considering delivering eggs to the city. So if anyone is interested, please let us know. We will begin as soon as there is enough interest. There is something incredibly satisfying about raising your own food. Today we butchered 8 geese and 2 turkeys. Our animals go to inspected processing facilities these days, due to regulations. However, these geese and turkeys were for personal use, so we got to kill them ourselves. This day was not one I was really looking forward to. It is a messy, bloody job and I have too many memories of childhood days lost with a naked chicken on my lap, searching for elusive pinfeathers. 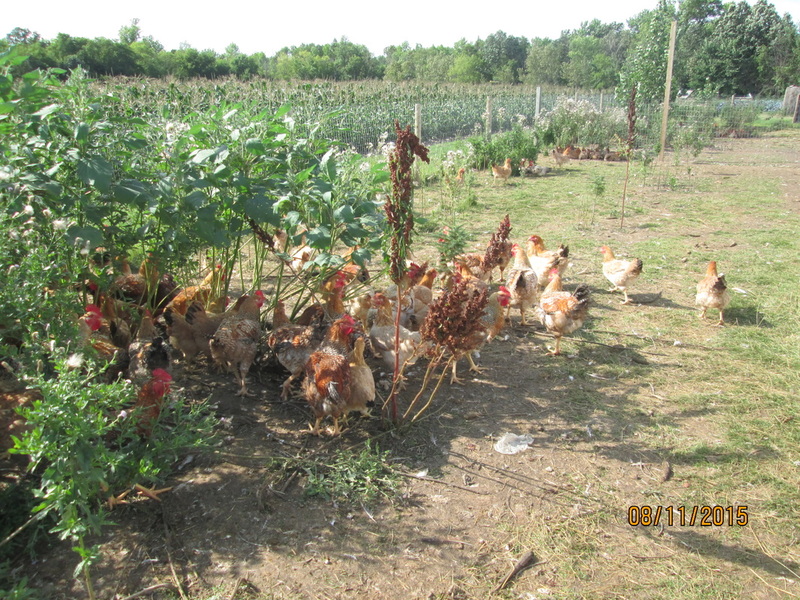 But things change and I somehow made it to 40 years old, and now raising my own food seems to be pretty cool. My mother came to help (supervise) and Heather and I got to hear stories from my grandparents butchering days. I did not know that turkey butchering meant it was time to set the table with a white tablecloth and Manischewitz wine. Or that you could spend an evening with neighbors stripping feathers for goose down. So, was it worth it? I know we could get cheaper food elsewhere. Actually, I can raise cheaper food. A goose will eat about 5 times more than a chicken for every pound produced. But how do you put a price on knowing your food? Or a day spent with your mother learning how things used to be and how, in some ways, they never change? I know us raising geese for fun and for a great meal does not compare to my ancestors need to survive but being a part of this continuum is no small part of the satisfaction. Who knows, maybe this year when we roast a goose we will find a white tablecloth! I do know we will spend time around the table with friends, a glass of wine and an appreciation for the many blessings we have. Yeah, it is worth it! Let it Snow, Le﻿t it Snow, Let it Snow!!! Technology can be a great thing. All too often I see it being used so much that I am disgusted by what it has done to our society and to our social skills. And that is my excuse for avoiding updating our blog and facebook page more regularly. I am afraid to become attached and dependent on my phone and internet connection. But when a call is received from a friend in South Korea, asking for more regular updates, I am reminded that some people do care what is going on here at Kurbis Country. I will try again. This one is for you Jusang! The fall has been beautiful. 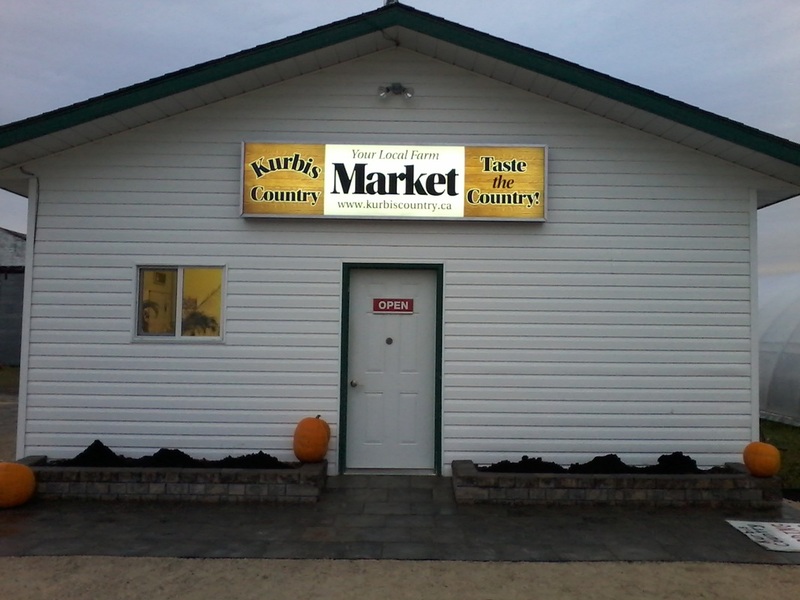 We have got all our field work done and still had time to finish the front of the store. I finally have a flower bed to play in and the light up sign we put up looks awesome! Thank you Rick! We had our annual pumpkin growing contest with a few friends and neighbours. This years first place prize goes to the Kintop family. 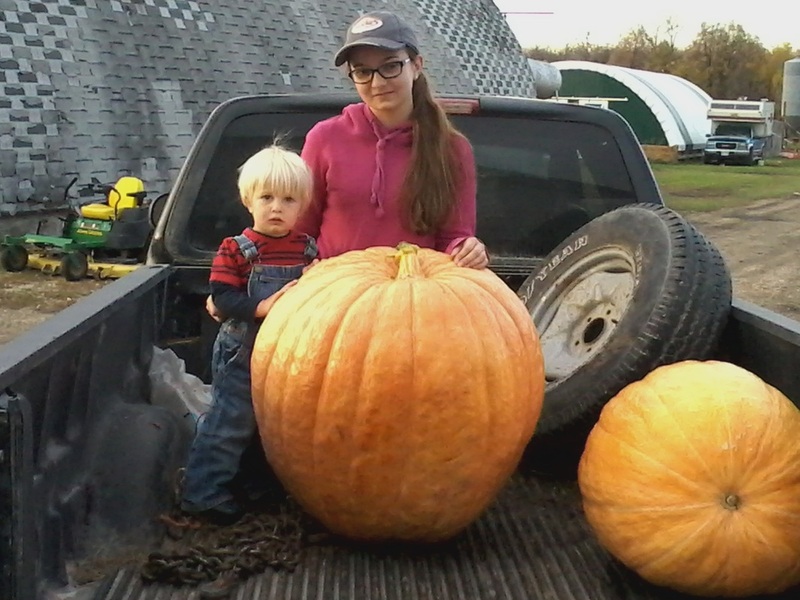 Their pumpkin weighed in at 164 lbs! In other news, we are still open all winter. 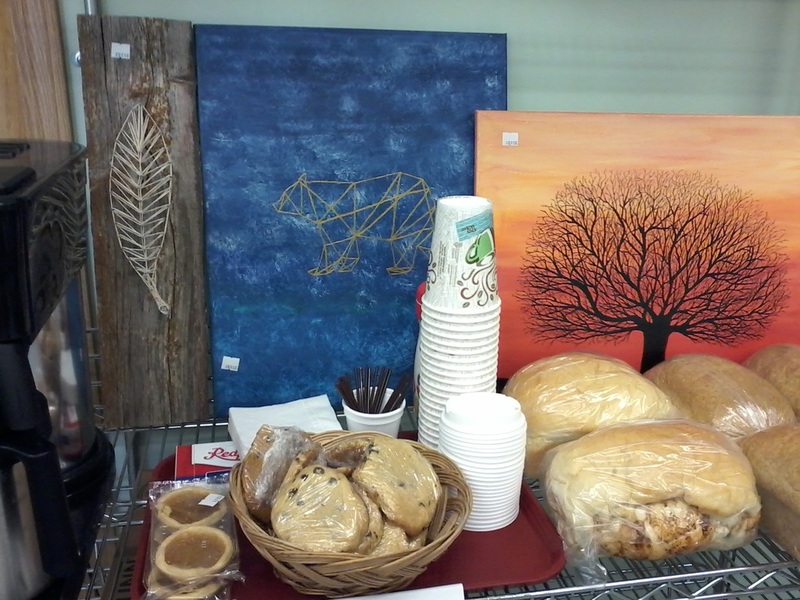 We are keeping fresh coffee brewing daily and still have homemade bread on the weekends. 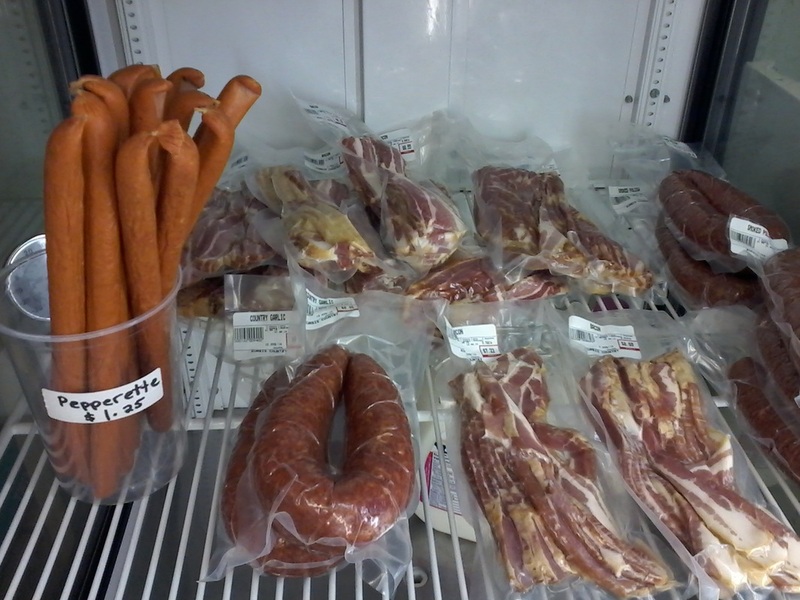 We are also still making sausage, pepperettes and smoked bacon. The storage vegetables will be available as long as quantities last. That would include potatoes, onions, shallots, pumpkins and squash. All of our other regular products are still on the shelf as well...homemade pickles and jams, local honey, wild rice, pet food, bird seed, livestock feed...and the list goes on. It has been a good season but now we are looking forward to the slower paced winter. Best tasting free run chicken...Grazer Chickens! After four years of raising Cornish Giants (the standard meat birds) and watching them struggle through their short , miserable lives, we decided we could no longer in good conscience continue to raise them. Although the birds were tasty, we felt something was lacking in the flavour. They were also bred to gain weight at an unnatural pace. Their hearts would explode, skin would split, feathers fell out and legs were crippled. To add to it all they were stupid and lacking instincts all chickens should have. So now we have switched to a Grazer chicken from Bergs Hatchery. It has been compared to what the Cornish Giant was in the 70's and 80's, before they were over-bred. The Grazers are phenomenal! From start to finish they were an amazing bird. They were healthy, happy and a pleasure to raise. The flavour is everything we had hoped it would be and more! The way a chicken should be!